On our previous list, Top 10 Amazing Natural Wonders, we covered a variety of amazing places. With this list we are showing some more amazing wonders which are less about places and more about formations and events. Be sure to add your own favorites to the comments for all to enjoy – preferably with links to images. 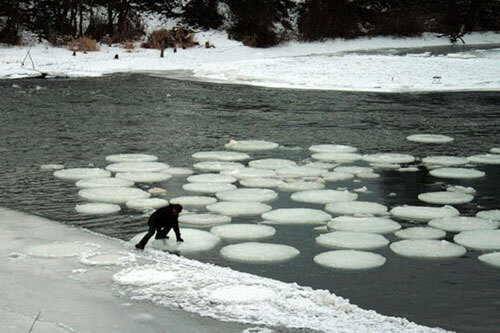 An ice circle is a rare phenomenon that occurs in slow moving water in cold climates. 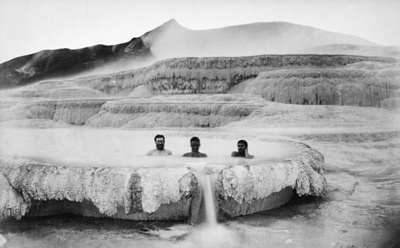 It consists of large discs of ice that rotate slowly in the water. It is believed that they form in eddy currents. Ice circles have most frequently been observed in Scandinavia and North America, but one was recorded in Britain in January 2009. Ice circles occur at bends in the river where the accelerating water creates a force called ‘rotational shear’, which breaks off a chunk of ice and twists it around. As the disc rotates, it grinds against surrounding ice — smoothing into a perfect circle. Red tide is a common name for a phenomenon more correctly known as an algal bloom (large concentrations of microorganisms), an event in which estuarine, marine, or fresh water algae accumulate rapidly in the water column and results in discoloration of the surface water. It is usually found in coastal areas. 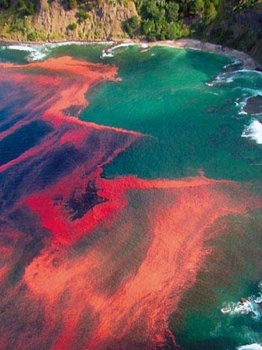 When the algae are present in high concentrations, the water appears to be discoloured or murky, varying in colour from purple to almost pink, normally being red or green. Not all algal blooms are dense enough to cause water discolouration, and not all discoloured waters associated with algal blooms are red. 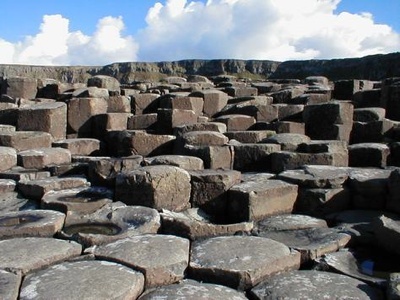 Columnar Basalts are rock formations resulting from the quick cooling of lava flow. Fractures form in a random cellular network (similar to soap bubbles, organic cells, etc. ), though the average distribution of sides is six, giving the hexagonal structures an eerie man-made appearance. Perhaps the most famous basalt flow in the world is the Giant’s Causeway in Northern Ireland, in which the vertical joints form polygonal columns and give the impression of having been artificially constructed. A sun dog is a particular type of ice halo. It is a colored patch of light to the left or right of the sun, 22 (or more) degrees distant and at the same distance above the horizon as the sun. 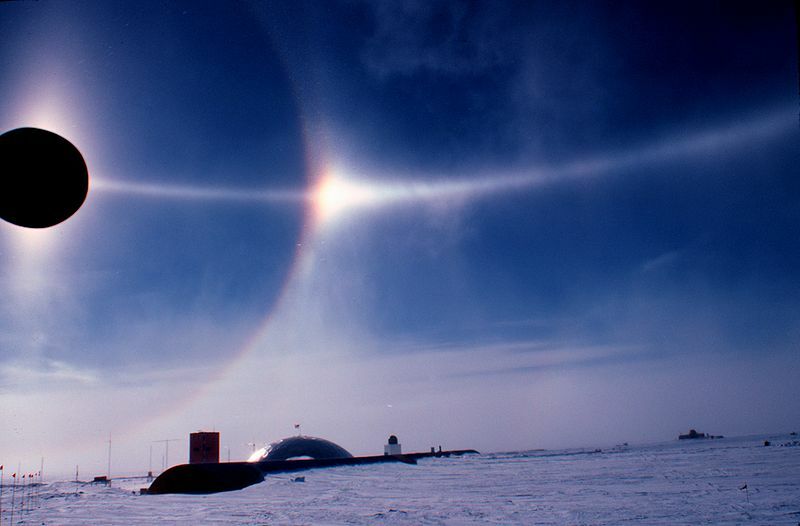 It is the most commonly or second most commonly seen of the ice halos. Sundogs can be seen anywhere in the world during any season. In Europe or USA they might be seen 1-2 times a week but not always obviously bright. They are best seen and at their most conspicuous when the sun is low. They are not rainbows. 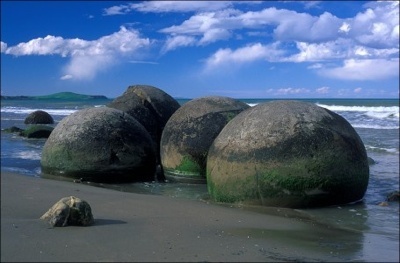 The Moeraki Boulders are unusually large and spherical boulders lying along a stretch of Koekohe Beach on the wave cut Otago coast of New Zealand between Moeraki and Hampden. They occur scattered either as isolated or clusters of boulders within a stretch of beach where they have been protected in a scientific reserve. The erosion by wave action of mudstone, comprising local bedrock and landslides, frequently exposes embedded isolated boulders. The most striking aspect of the boulders is their unusually large size and highly spherical shape, with a distinct bimodal size distribution. About one-third of the boulders range in size from about 0.5 to 1.0 metres (1.5 to 3 ft) in diameter, the other two-thirds from 1.5 to 2.2 metres (4.6 to 6.7 ft), the majority being nearly to almost perfectly spherical. 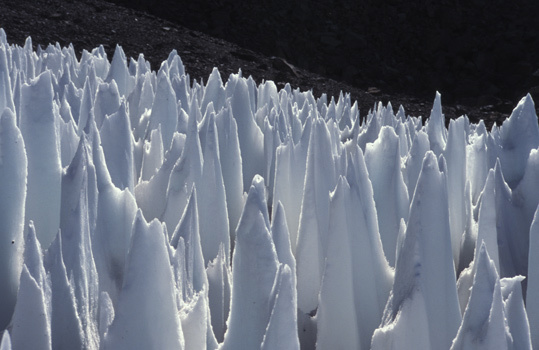 Penitentes are a snow formation found at high altitudes. They take the form of tall thin blades of hardened snow or ice closely spaced with the blades oriented towards the general direction of the sun. Penitentes can be as tall as a person. Penitentes were first described in the literature by Darwin in 1839. On March 22, 1835, he had to squeeze his way through snowfields covered in penitentes near the Piuquenes Pass, on the way from Santiago de Chile to the Argentinian city of Mendoza, and reported the local belief (continuing to the present day) that they were formed by the strong winds of the Andes. 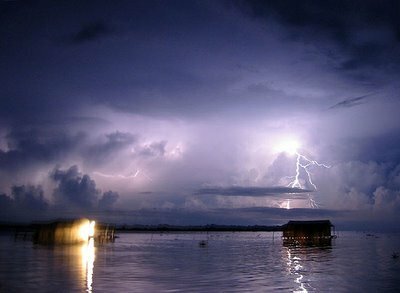 The Catatumbo Lightning in Venezuela is the world’s largest single generator of ozone. It is a cloud storm that forms a voltaic arc at more than 5 km of height, during 140 to 160 nights a year, 10 hours per day and up to 280 times per hour, over the bog area that forms where the Catatumbo River flows into the Lake Maracaibo. 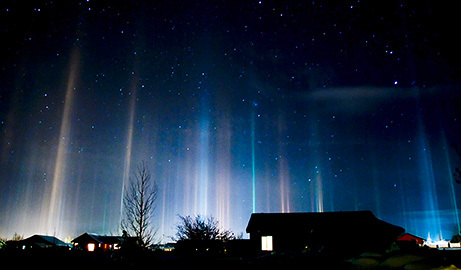 The phenomenon is easy to see from hundreds of miles away, i.e. from the lake (where no clouds usually occur at night) which is also known as the Lighthouse of Maracaibo, as the boats that sail the area can navigate at night without any problems at the time of sailing. 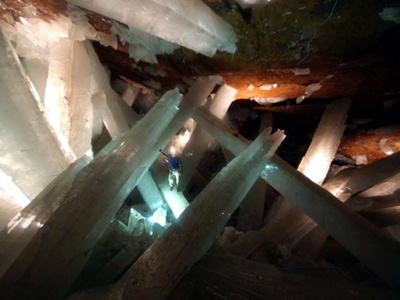 Cave of the Crystals) is a cave of the Naica Mine in Chihuahua, Mexico. The chamber contains giant selenite crystals, some of the largest natural crystals ever found. The cave’s largest crystal is 36 ft in length, 13 ft in diameter and 55 tons in weight. The cave is about 98 ft in length and 33 ft in width. The cave is extremely hot with air temperatures reaching up to 109F with 90 to 100 percent humidity. The cave is relatively unexplored because humans can only survive for approximately ten minutes without proper protection. As you can see from the image above, this is one of the most stunning wonders of the natural world. This is our second New Zealand item on the list and, sadly, the only item which is now lost to man. The pink and white terraces were considered a natural wonder until they were destroyed by the violent volcanic eruption of Mount Tarawera in 1886. Geothermally heated water containing large amounts of siliceous sinter regularly spouted from two geysers located beside Lake Rotomahana and cascaded down a hill slope, leaving thick pink and white silica deposits that formed terraces enclosing pools of water. The White Terraces were the larger and more beautiful formation, covering 3 hectares and descending 30 metres, while the Pink Terraces were where people went to bathe. The Pink and White terraces have been dubbed by a number of people as “The Eighth Wonder of the World”. Pictured above are people bathing in the warm pools of the terraces. You can view an artists impression of the terraces in color here.